This recipe is favored in the north of Vietnam for its salty, sour notes. We were impressed with this salad’s textural lightness in contrast with its vibrant flavors. In Vietnam produce sold the day it is picked. If you can, purchase the produce from a local farmers market for fresher and brighter flavors than supermarket ingredients. You can prepare the ingredients several hours prior to assembling the salad and keep them at room temperature. The flavors are more vibrant if tossed just before serving. Marinate the beef at least one hour ahead and cook it when you are ready to serve. Combine all marinade ingredients (except the beef) in a food processor and run for 30 seconds, until well chopped. Combine marinade and beef in a bowl. Let stand 30 minutes to1 hour. Lift the beef from the marinade and squeeze out the liquid. Discard liquid. Beef can be done to this stage several hours ahead. Cook just before serving..
Soak glass noodles in warm water for 5 minutes until pliable (al dente) then rinse briefly in cold water so they don’t stick. Drain and set aside. Slice onion into very thin moons and soak in salted water for 10 minutes (lessens the acidity). Drain and discard the water. Remove the seeds and thinly slice the mild chili or red bell pepper. Rinse the herbs, shake dry, pull the leaves off and discard the stems. Pile the herb leaves on a cutting board and chop well. Gather in 2 layers of paper towels and squeeze firmly to remove excess liquid. Set aside. To make the dressing combine rice vinegar, sugar, fish sauce and finely chopped fresh red chilies. In a medium bowl combine noodles, sprouts and onion with the dressing and let sit while you cook the beef. Heat a large fry pan over high heat (turn on exhaust fan as searing the beef can cause fumes).Fry half the beef strips just until seared, about 2 minutes, stirring only once. Set aside while you cook the rest. Drain the noodle mixture from the dressing and squeeze gently to remove excess liquid. Place in a bowl and using you hands or chop sticks (to keep the texture light) gently fold in the mild chili or red pepper, chopped herbs and beef. Serve on individual salad plates. Cook’s note: Glass noodles (sai fun), fish sauce and Asian hot sauce are often available in a supermarket. 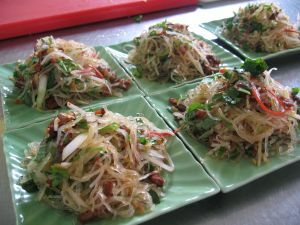 Although you can make this dish with rice or wheat flour noodles this recipe is designed for the lighter texture of glass noodles. If you can’t find Asian herbs substitute familiar herbs such as basil, mint and cilantro.